Swansea XI: Fabianski, Naughton, Fernandez, Williams, Taylor, Britton, Ki; Routledge, Sigurdsson, Barrow, Ayew. Sunderland XI: Mannone, Jones, Brown, O'Shea, van Aanholt, Cattermole, M'Vila, Borini, Lens, Johnson; Defoe. You can read the match report by clicking here and for now from me, it's goodnight. Thank you for your tweets. What a game. And that will be that. A closing five minutes which offer little as the race is run. Where do Swansea go from here? I can tell you where Jermain Defoe is going, he's raced to get the match ball. A hat-trick worth so, so much for Sunderland. What a result for Sunderland. Some keep ball and a Swansea side now punch drunk and beaten are all we are seeing. This is done. Turn the lights out. That is the hat-trick. Again it's the right-back area exposed, again it's Patrick van Aanholt leading the assault and again Jermain Defoe is the fox in the box to convert the cut-back from six yards. That will surely be that. Danny Graham is introduced against his former club, he replaces ex-Swan Fabio Borini who claps the away fans as he walks off. This is looking good for Sunderland now. Set plays look the best hope for Swansea and they are exposed at the back to say the least. As you can see, since going down to 10 men Swansea have had to retreat in terms of territory and have seen far less of the ball. They were up as high as 70% possession in the opening half an hour. Ki gets forward down the left but cannot summon an effort of meaning. Bafetimbi Gomis is introduced for Wayne Routledge. He will partner Andre Ayew through the middle. We enter the dark period. There has not been a goal in the final 15 minutes of a Premier League game at the Liberty Stadium this season. It's the only ground with that record. Swansea, this has to change now. Neil Taylor advances down the left for Swansea and is invited to shoot. He has a dig, flashes across goal and wide. James Parker: Jermain Defoe for England...? Defoe has now scored eight Premier League goals this season so you never know James. Jermain Defoe is through again, he rounds the keeper for a hat-trick but this time, unlike last, the offside flag is up. Is there another one out there for Swansea? The Black Cats have conceded 39 goals - a league high. Vito Mannone into the book. Time wasting from the Sunderland goalkeeper who wanted about 25 minutes to take a goal kick. Even when he's winning Sam Allardyce is showing the strain. "You're not fit to referee," comes the home cry. Swansea manager Alan Curtis was fuming when that latest effort was chalked off. Swansea think they are level, Angel Rangel turns the ball in from a yard after a Vito Mannone handling error. The flag comes up though and rightly so. He was offside from the initial shot. 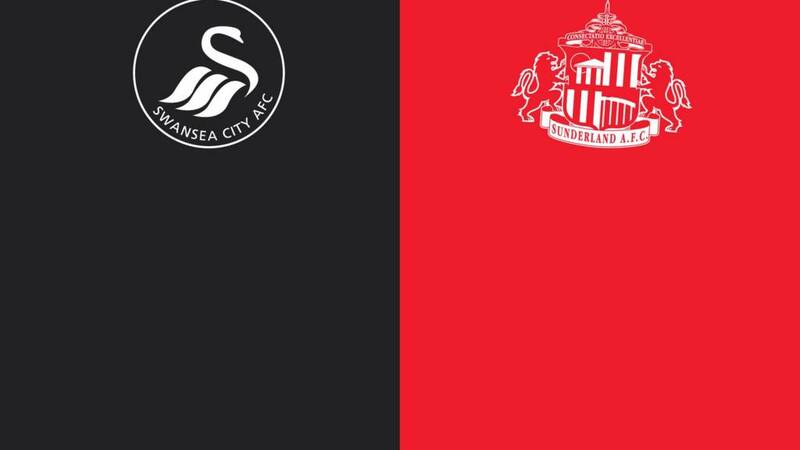 Swansea City, put your heads in your hands. This is just too easy. Adam Johnson has time on the halfway line to thread a ball for Jermain Defoe. The hands go up for offside but it's not given. It's a curved run, expert stuff, then a simple passed finish into the corner. Defoe had no one chasing him. The white shirts just asked for a flag that wasn't coming - though replays show it should have. Surely you at least give chase? This game takes another turn. Jeremain Lens breaks into the area and looks to have over run the ball but gets tame shot off from a tight angle. It should be food and drink for Lukasz Fabianksi but goes through his legs and hits the near post. He got lucky. Big time.